Argentina is known for its beef, but it should also be known for the perfect condiment for that beef: chimichurri sauce. An herb sauce that can be found on every table in Argentina (it’s the Argentine version of ketchup), this delicious sauce is the perfect accompaniment to any grilled meat. From humble skirt steak to a New York strip, your belly will say “yes” to this flavorful and green addition to your next cook-out. Traditionally, chimichurri sauce is made with parsley and oregano, but my version uses cilantro for a little twist. 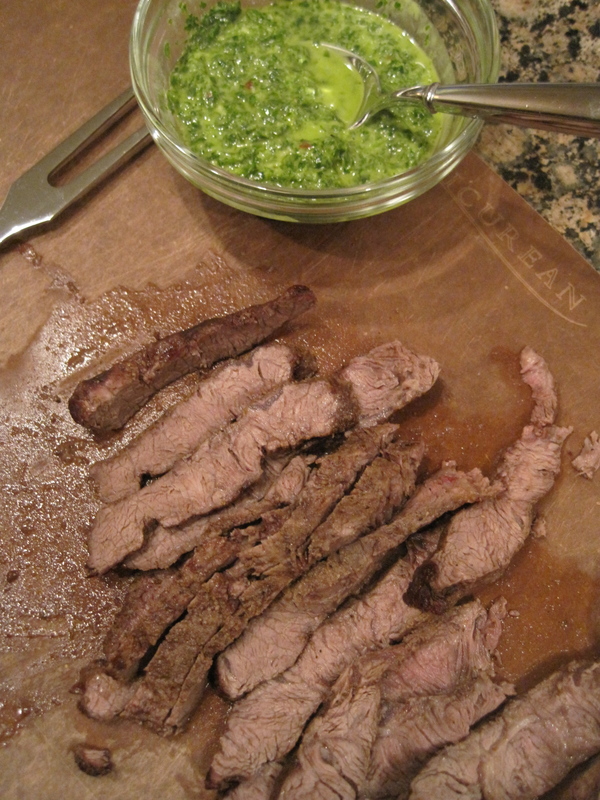 For a busy weeknight, I love to serve chimichurri sauce with a flat iron steak or flank steak, both of which are fairly economical cuts of meat that easily feed a crowd. With the help of a food processor to make the chimichurri sauce, dinner comes together in minutes. Hungry for more? Click here to see me demonstrating how to make this recipe on WCNC’s Charlotte Today show. Heat a grill or grill pan over medium-high heat until very hot. Use a mortar and pestle (or spice grinder) to crush the coriander seeds. In a small bowl, stir together the ground coriander seeds with the cumin, salt, and freshly ground black pepper. Sprinkle the spice mixture over both sides of the steak and rub it in using your hands. Brush the grill or grill pan with olive oil. Add the steak and grill for about 5 minutes on each side for a 1-inch thick piece of meat. Adjust the cooking time as needed depending on the thickness of your steak. While you can cook the steak to your preferred level of doneness, cooking it to medium-rare will yield a more tender final product. When steak is ready, remove it from the grill and let it rest on a cutting board for at least 10 minutes before slicing. Meanwhile, put the flat leaf parsley, cilantro, garlic clove, salt, pepper, hot red pepper flakes, and olive oil in a food processor. Process until finely chopped and the mixture is smooth, scraping down the sides as needed. Right before serving, add the red wine vinegar and process until combined. Adjust the seasoning as needed. Thinly slice the flank steak against the grain. Serve with the chimichurri sauce. I was in Charlotte today and could have watched you live. My mother made flank steak the Sunday cookout dinner whenever I came home from college or once I moved away from home. Never did we do Chimichurri sauce and it looks like we were really missing something!! All of a sudden Minced has posted two foods back to back. Haven’t had time to make the cookies yet. Now we are expecting another foodlove recipe in a couple of days! Carl – Thanks for the comment and I completely agree that it is more done that I typically like it. However, I was making it for someone who prefers their meat more well done and unfortunately did not have the time to make another one for the photo. For a perfectly cooked (in my book!) flank steak, check out the recipe for Flank Steak with a Watermelon Salsa (https://mincedblog.com/2011/08/10/grilled-flank-steak-with-watermelon-salsa/) on this blog. I think you’ll find that it is cooked more to your liking!